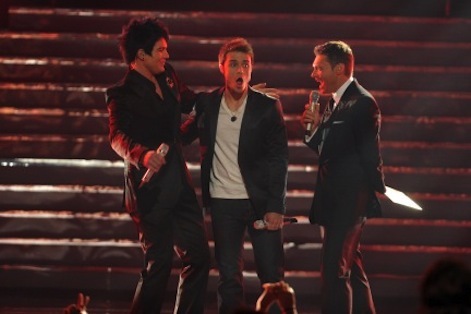 Kris Allen's American Idol triumph over season-long favorite Adam Lambert of course dominated Wednesday's last official night of the 2008-09 network TV season. Fox's two-hour extravaganza averaged 504,868 D-FW viewers, falling just short of Tuesday night's elongated Dancing with the Stars finale on ABC (518,154 viewers). But Idol peaked at a higher plateau, amassing 704,158 viewers for the post-9 p.m. bleed-over in which Allen was anointed. Dancing peaked at 617,799 viewers for its final 15 minutes. Local ratings were helped by the presence of Dallasite Melissa Rycroft as one of Dancing's three finalists. The Idol finale also outdrew Dancing among advertiser-craved 18-to-49-year-olds, by an overall score of 217,160 to 191,231. Everything else played dead Wednesday night except CBS' two-hour season finale of Criminal Minds, which drew 325,507 total viewers in the 8 to 10 p.m. slot. ABC filled the night with Pirates of the Caribbean: Dead Man's Chest, which barely registered with 79,716 viewers. CBS11 swept the 10 p.m. field in total viewers and 25-to-54-year-olds, the main advertiser target audience for news programming. NBC5 again did likewise at 6 a.m., where it will roll up May's most decisive victories in the four major newscast battlegrounds. WFAA8 won at 6 p.m. in total viewers, but CBS11 recorded an exceedingly rare first place finish among 25-to-54-year-olds, beating Fox4 by less than a sliver (one-hundredth of a rating point). So in reality, it's tie, even though CBS11's 1.15 rating will be rounded up to a 1.2 in the official ratings "book" while Fox4's 1.14 rating will be rounded down to a 1.1. Fox4 and WFAA8 statistically tied for first at 5 p.m. in total viewers, with Fox4 winning the 25-to-54 demographic.